Carrying out an end of year review is an important step for any business owner, no matter the size of the company. It’s an opportunity to take stock of where you are, tie up any loose ends, look at what you’ve achieved, set some new goals and consider how you are going to get there. 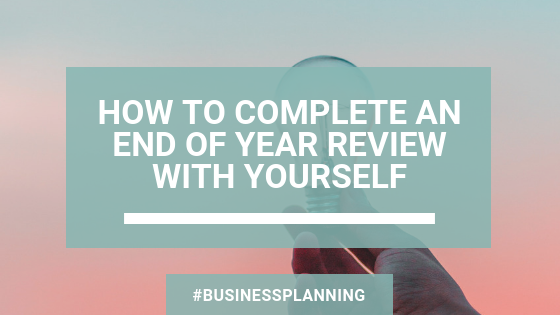 Here is our guide on how to complete an end of year review with yourself. If you have previously set goals and objectives for your business, this is your opportunity to review where you are at and take stock of your position in business. If you haven’t set any specific goals, it’s still your chance to evaluate how your business is performing. What have you achieved so far this year? How did you get here? What services or products have you launched this year? How well did their launches go? How well have they been received? Review where you’re at, but also look at ways you could potentially improve the next time around. Not quite organised enough to follow up after an event? What steps can you put in place next time to ensure a smoother follow up system. The most obvious way to review where you are at with your business is to look at the figures. Whether that’s reviewing your website traffic, your Facebook followers and likes, the size of your email list subscribers, as well as the obvious of your incoming and outgoing expenses. Knowing your numbers is a great way to see how your business is performing and helps to highlight the areas where you need to focus your attention to grow your business. Part of taking stock of where you and your business is at is looking at your day-to-date activities. What has been taking up the majority of your time? What projects and tasks have you been putting off or have dreaded doing? Is there anything you can look to outsource for next year to ease the burden or save you time? It’s so easy to overlook the good things that have happened by focusing on the negatives. However, it’s so important to review and acknowledge all the wins and achievements; no matter how big or small. Take time to celebrate each and every one. What was your biggest achievement of the year? What achievement gave you the most satisfaction? Were there any new relationships and partnerships that contributed to your success? It’s not just about looking at how your business has performed over the past year, but also how you are and where you are at. Have things become so busy you’re feeling a little stressed and overwhelmed? Did you make any changes that have helped your business run smoother to take some of the stress from you? Have you been working yourself into the ground or did you manage to take some well-deserved time out just for you? You are the key to driving your business forward and it’s imperative that you review how you are doing as well as your business. If your energy, confidence or happiness levels aren’t where they need to be, make some New Years resolutions that will help to get you into a healthier more positive mindset next year. It’s always useful to regular review your mission statement and values for your business, not only to ensure you are on track to achieve what you have set out to do, but it’s also an excellent opportunity to tweak and enhance your purpose and what your clients want and need from you. And the most important thing after completing your end of year review is to set goals for the coming weeks, months and year. Where do you want to be this time next year? How are you going to achieve that? Start working from where you want to be and work backwards to look at what you need to do to achieve those goals. Remember to set realistic deadlines and goals that you can work towards, but also include something that will push you out your comfort zone. If you are looking to help ease some of the stresses and strains you’ve experienced over the past year or ways to improve and run your business more efficiently, why not see how The Assistant Quarters could help you. Call Claire on 07961 120071 or email claire@theassistantquarters.co.uk to find out more.